Rev. William R. Anson, CSV, died on Saturday, Nov. 22, 1986 at Silver Cross Hospital in Joliet, IL. He had been a patient there for ten days in deteriorating condition after a six-year period of being on dialysis. Bill was sixty-three years old. Visitation was held on Monday, Nov. 24, 1986 at Our Lady of the Angels Retirement Home where Father Anson had been serving as Chaplain for the past five years. 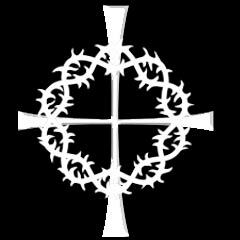 The Mass of Resurrection was celebrated on Tuesday, Nov. 25, 1986 at 10:00 a.m. at St. Paul the Apostle Church in Joliet. Burial was at Resurrection Cemetery in Joliet. Prior to his assignment at Our Lady of the Angels, Bill was pastor of St. Anne Parish in St. Anne, IL (1976-1981). 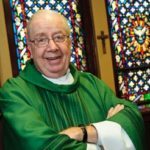 He had been living at that parish since 1969 when he was a teacher at McNamara (1969-1971), Principal of St. Rose-St. Martin Elementary School (1971-1972), and teacher at St. Joseph School in Bradley, IL (1972-1974). 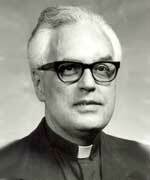 From 1974-1976 he served as Development Director for the College of St. Francis in Joliet. Bill was Director of Scholastics for the Province for four years (1964-1968). He was on the faculty of Cathedral Boys High School (1950-1953), Spalding Institute (1953-1955), Alleman High School (1955-1962) and Gorman High School (1962-1964). He was the Principal of Gorman during those two years. At the time of his death Bill had been forty-three years in the Congregation. His first profession was in Bourbonnais in 1943. He studied at St. Ambrose College and at St. Thomas Seminary in Denver. Bishop McNamara ordained him to the priesthood in 1950. During much of his life in the Community Bill suffered from physical pain and illness. It was a severe hardship for him but also a source of strength. During his years at Our Lady of the Angels, Bill ministered to the aged and the dying by his example of patient endurance and graciousness. He refused to become a victim of his handicap. May he be healthy, whole and at peace now with the risen Christ.